for the spring assembly of the Federation of Sovereign Indigenous Nations (FSIN). 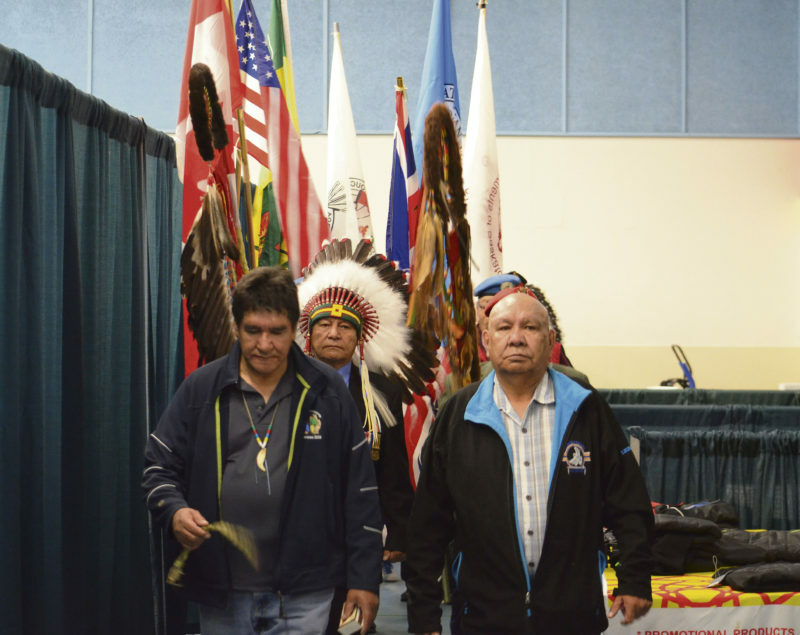 The two-day assembly kicked off Wednesday with a pipe ceremony and a procession of the flags, followed by speeches from several dignitaries, and continued into the afternoon with the assembly debating and passing several resolutions. The formal remarks were begun by Chief Peter Beatty of Peter Ballantyne Cree Nation, which is hosting the assembly this year. He welcomed the chiefs to his territory before passing the microphone to FSIN Chief Bobby Cameron. “We have a long couple of days, but very important days,” Cameron said, before delving into some of the issues he sees as important. He expressed concern about new fees charged to trappers to sell their fur. He emphasized the need to work together. He was followed by the Saskatchewan First Nations Women’s Commission Chief Joanne Roy of Waterhen Lake First Nation. For more on this story, please see the May 18 print or e-edition of the Daily Herald.